THE DEMOCRATIC PARTY is sharply divided these days, split between its liberal establishment and a zealous left-wing insurgency. The rift dominated Democratic politics in the last presidential campaign, when Hillary Clinton, despite her iron grip on the Democratic National Committee, faced an exuberant primary challenge from Senator Bernie Sanders. The latest evidence of the fault line running through the party came on June 26, when primary voters in Queens, N.Y., rejected longtime congressman Joe Crowley, the fourth-ranking House Democrat, in favor of newcomer Alexandria Ocasio-Cortez, a 28-year-old member of the Democratic Socialists of America. Intraparty divisions aren't uncommon in American politics, and this isn't the first chasm to rend the nation's oldest political party. Democrats these days may find themselves fighting over everything from trade policy to gun ownership to health care, but they have battled each other over weightier matters in the past. In the 20th century, none was more consequential than civil rights. For decades a divided Democratic Party had strenuously ignored calls for black equality. Seventy years ago this week, that changed. 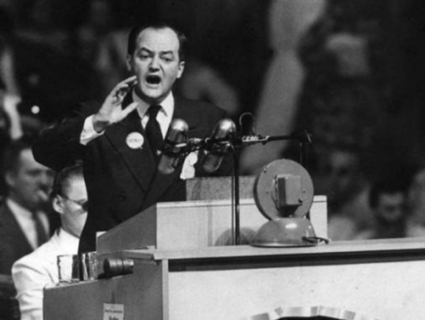 Minneapolis Mayor Hubert H. Humphrey pleaded with his party at the 1948 Democratic national convention to stop enabling racial oppression and take a stand in favor of civil rights. During the generations that followed Reconstruction, the "solid South" was the Democrats' stronghold, as unshakably opposed to the Republican Party — the party of Lincoln and emancipation — as it was relentless in subjugating blacks. By no means did all Democrats oppose civil rights. After World War I and the Great Migration of African Americans to the industrial cities of the North and Midwest — cities where they could, and did, vote — growing numbers of Democratic liberals above the Maxon-Dixon line expressed support for ending segregation. But the party depended on its monopoly in the South. That monopoly was key to Democratic control of Congress and a cornerstone of every Democratic presidential campaign. Since Southern Democrats were adamant in their hostility to civil rights, the national Democratic Party repeatedly turned a blind eye to the brutal repression of African Americans. When the Democrats convened for their national convention in Philadelphia on July 12, 1948, there was no reason to expect anything different. The delegates had gathered to nominate Harry Truman, who had become president upon the death of Franklin D. Roosevelt, but few believed he could win. "His prospects could not have appeared much more grim," historian David McCullough would later write. "He faced a strong, heavily financed, supremely confident Republican opponent" — Governor Thomas Dewey of New York. Some ardent New Deal liberals had tried to draft Dwight Eisenhower as the Democratic standard-bearer; others were peeling off to support the far-left third-party campaign of Henry Wallace. With Truman's election so uncertain, the last thing party leaders wanted was to alienate Southern voters, the most reliable Democrats in the country. In February, Truman had urged Congress to enact legislation abolishing poll taxes, desegregating the armed forces, banning Jim Crow in interstate transportation, and making lynching a federal crime. But Congress, under the thumb of the South's barons, had done nothing, and Democratic leaders had no desire to see the contentious issue of civil rights reawakened at the convention. So when the southerners demanded that the party platform include merely a vague call for the protection of all citizens' rights, party elders agreed. But a handful of northerners, led by Minneapolis Mayor Hubert Humphrey, refused to go along. 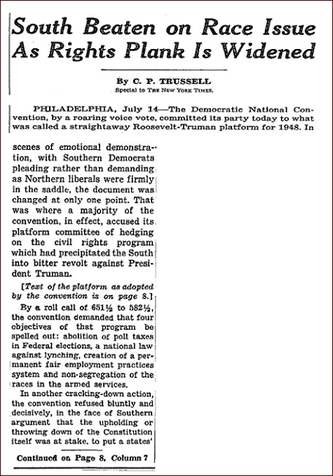 For two days they fought for the adoption of a much stronger civil rights plank, and when the platform committee voted overwhelmingly against them, Humphrey took the fight to the convention floor. He was warned not to do it. Pushing the issue, he was told, would split the party, ruin whatever chance Truman had of getting elected, and permanently end his own political career. But Humphrey passionately felt that his party must stop enabling racial oppression. "If there is one thing I believe in in this crazy business," he told his friend Orville Freeman, a future Minnesota governor, "it's civil rights. Regardless of what happens, we are going to do it." Taking the podium in the sweltering hall — there was no air conditioning, and the temperature was 93 degrees — Humphrey made his case. Speaking not just to the delegates before him but to the 60 million Americans listening to the convention on the radio (and the much smaller audience watching on a new medium called television), he insisted that America could not support democracy abroad while denying it to so many at home. He linked the goals of the minority plank to the party's highest ideals. It was front-page news when the Democratic Party, for the first time in its long history, came out in support of ensuring black equality. The 1948 civil rights plank was a stinging defeat for the Democrats' racist southern stronghold. "To those who say that we are rushing this issue of civil rights, I say to them we are 172 years late," Humphrey cried. The convention roared in approval. In a line that would be quoted again and again, Humphrey swept aside the segregationists' invocation of states' rights. "The time has arrived in America for the Democratic Party to get out of the shadow of states' rights and to walk forthrightly into the bright sunshine of human rights." In so doing, he argued, they would be saying "in unmistakable terms that we proudly hail, and we courageously support, our president and leader Harry Truman in his great fight for civil rights in America." It worked. By a vote of 651½ to 582½, the minority plank was adopted. Southern delegates were furious. Many walked out. But the speech "had galvanized the convention to adopt the first civil rights platform in the Democratic Party's history," as the historian Arnold Offner writes in a new biography of Humphrey. It also galvanized black voters in the north. In November, Truman lost four Southern states, but, buoyed by black turnout in Cleveland and Chicago, carried Ohio and Illinois to win the election. Genuine progress on civil rights was still years away, but tide had turned in the Democratic Party. Democrats had, at long last, tied civil rights to their masthead — and, 70 years later, it's still there. Whatever else Democrats may fight over today, they all believe themselves to be defenders of civil rights. The party of Hubert Humphrey lost the South, but gained a new identity in the process. Why is a great Senate office building named for a modern racist?